Kale is fairly new to me. My family isn’t really excited on trying new veggies and they like to stick with what they know. Every once in awhile I will get Faith to try something new, but she is really the only one. I really like sausage, no one else here really does. So when I fix sausage I am really the only one who will eat it. I love the flavor and it’s filling. Anyway, I decided I was going to try a sausage and kale pizza made on keto fat head dough. I like to add in some garlic powder/salt or even some italian seasoning, just a bit! This is totally optional. First off…..melt the shredded mozzarella and the cream cheese in a microwave safe bowl. I do 30 second intervals until it’s melted. Once melted add in the almond flour and stir to combine. This will also help cool off the batter in order to add the egg in! You got it…..add in your egg. Stir to combine. Add in your seasonings, mix a bit more. Preheat oven to 425 degrees. Lay out some parchment paper (I lay mine out on my pizza stone) dump your dough onto the parchment paper and begin kneading a bit. Spread it out to around 11 inches. Don’t make it too thin otherwise you might burn it in the oven. Once you have worked it out into a nice round pizza shape throw it in the oven for about 10-12 minutes. When it is golden brown it’s done. While the pizza dough is baking, cook up your sausage. Gather up some more mozzarella and kale. It really didn’t take but about 1/4 cup to 1/2 cup of kale (uncooked). Once the pizza dough is finished pull it out and top it with your sausage, kale, and mozzarella. Pop it back into your 425 oven for about 10 minutes (I didn’t pay attention to time here) just keep an eye on it! I kept checking to see if everything was melted the way I wanted it!! Once it’s to your liking pull it out, slice it up, and have it! Don’t forget the glass of wine! Now here’s where I am questioning myself……I did not cook the kale with my sausage, I put it on my pizza straight from the package. I think next time I might throw the kale in with the sausage just for it to soak up the sausage flavors. Honestly, I really liked this pizza. 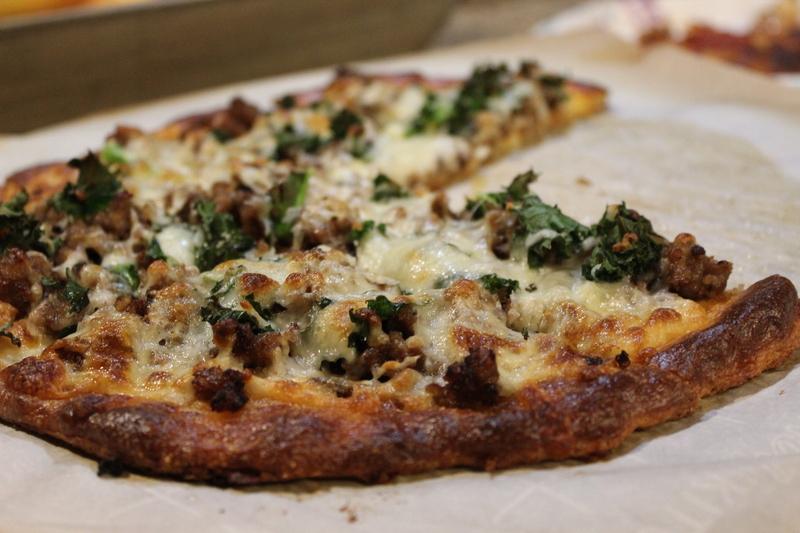 The dough had great flavor and the sausage and kale were perfect together. It’s great for a quick dinner and my left overs warmed up nicely the next day. Try this one….you won’t regret it. This entry was posted in Low-Carb/Keto and tagged Gluten free, kale, kept dough, pizza, sausage. Bookmark the permalink.